With Pope Francis’ trip to Cuba and the United States, it has come to my attention that Pope worship, or Papolatry, is at a record high. Many of these Catholics who are guilty of Papolatry are responding rather negatively about those who are criticizing Pope Francis’ actions, in regards to his public speeches, as well as his general conduct. A year ago I wrote in some length about how the Pope is not infallible when it comes to anything he does off-the-cuff or outside of the realm of teaching faith and morals as long as it is done with respect to the office of the Papacy and charitably. You can read that here. This week I have been bombarded with accusations saying that I am not a good Catholic due my criticisms and disagreements with Pope Francis. One accusation that was thrown my way was that I was “being an unfaithful son of the Church”. It struck me as odd that criticizing the Pope’s words, especially when he is speaking of his own personal opinions (read: not official Catholic teaching) is considered being an unfaithful son. Even more ironic is that more often than not, you can find Pope Francis’ speeches actually conflict with Catholic thinking regardless if his predecessors Popes John Paul II or Benedict XVI performed the same actions or speeches. I, as a faithful son of the Church, am to reject heresy, no matter who utters it. 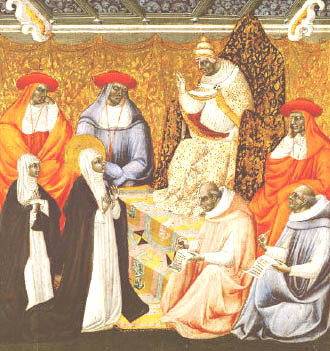 I imagine these papolaters would have been the first in line to criticize St. Paul when he criticized Pope St. Peter, St. Catherine of Siena when she criticized Pope Gregory XI or St. Athanasius when he fought tooth and nail against Arianism, even being excommunicated for doing so. While I’m not a saint, to say that no-one can criticize the Pope is an error that is proven wrong by the aforementioned saints. They saw heresy and fought it. This pontificate is riddled with error and Modernism. To argue otherwise demonstrates a lack of knowledge of Catholic teaching and a lack of understanding of Dogma and Doctrine. We have a Pope who claims to defend the Family, yet is inviting mostly the enemies of the Family and the Church to the Synod. He proudly announces how “serene” Cardinal Kasper’s theology is and how it’s an example of doing “theology on one’s knees”. We are in odd times, and to falsely proclaim that we can’t point this out is willful ignorance and promotion of error. These individuals may call me a poor son of the Church, but I won’t ever stop pointing out the errors of this pontificate. I will not tolerate error. Continue to fight against error. We have 2,000 years of Church teaching to stem from, not the last 50 years or even worse, the last two and a half. Jesus Christ is unchanging. If you encounter a teaching that is contrary to what Jesus has given, then you can be assured that it is incorrect, no matter who says it, including the Pope. Amen, Jeff! Papolatry is indeed alive and well, contrary to all reason. An older woman at a TLM yesterday told me how glad she was of the Orthodoxy of the Pope, and I had to wonder if senility had kicked in, and she thought Pius X was our pontiff!